I love summer… it means an end to storytime! My storytimes are done for the summer! Finally. Thank god, because I am so tired. Fortunately, the kids really liked it, but I was ready for a break… Now on to the Summer Reading Program! This is the first year (ever, possibly) that the library is doing the state summer reading program. This year it is called Read White and Blue which I think is pretty silly, but I want to be involved in what the rest of NYS is doing. Call me crazy, but I don’t want to be the odd (wo)man out. So here it goes. It should be fun. The kids are going to travel (with little paper cars) around the USA and visit weird places. they’ll get prizes along the way and entries into a grand prize drawing. My personal life isn’t anything to shout about (boring) but at least I’m keeping busy at my job. 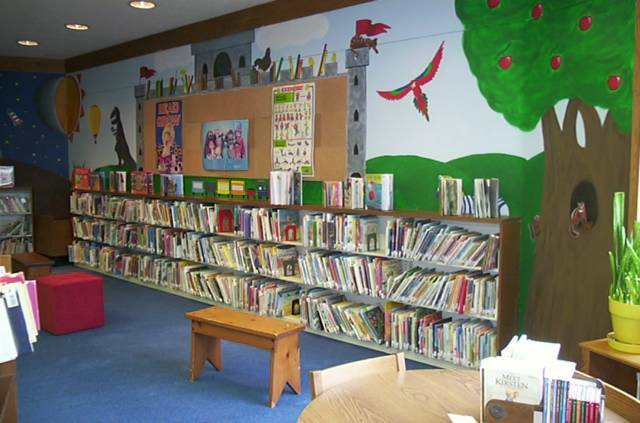 Posted in Librarians | Comments Off on I love summer… it means an end to storytime! I also invited the high school seniors portfolio class to paint a mural in the children’s area. It’s starting to look so cool! On a non-library note, I finally convinced my husband that we need to add on to our little family. So now all the work begins!